PA chief negotiator says the PA will not agree to the status quo, threatens the PA will dismantle itself and “hand the keys” back to Israel. 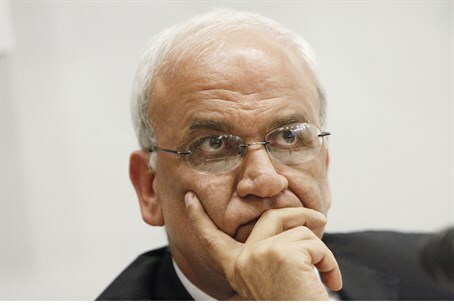 The Palestinian Authority’s (PA) chief negotiator, Saeb Erekat, on Sunday said that the PA will not agree to maintain the status quo and threatened that the PA will dismantle itself and “hand the keys” back to Israel. Speaking to Army Radio, Erekat referred to Israel’s decision to withhold the tax money it collects on behalf of the PA, which came in response to the PA’s request to join the International Criminal Court, and called it “collective punishment” and a “war crime”. The comments by Erekat are not the first time that PA leaders have threatened to cut ties with Israel and dismantle the entity. In October, PA Chairman Mahmoud Abbas threatened to cut ties with Israel if his unilateral move at the United Nations fails, though at that time he said he would not disband the PA.
"If all efforts fail, we will end relations with Israel and I will tell Israeli Prime Minister Binyamin Netanyahu, ‘Come and take over’. However, I will not dismantle the Palestinian Authority and I will submit a request to join all the organizations belonging to the UN," he declared. Previously, however, Abbas hinted at plans to dismantle the PA and thus enact a serious blow to Israel through international legislation. Dismantling the PA would transfer all responsibility for the Palestinian Arabs to Israel, dissolving the Oslo Accords. But it would also leave Israel vulnerable to litigation over the "settlements" in international courts - and change Israel's demographics to tip the religious and ethnic majority.